I hate to give a bad review knowing way out in the boonies people are just trying to make a living, but this was bad food and service. I ordered a simple dish, beef with broccoli. Hard to really mess up. But this was the worst I ever had. It barely had any flavor, the beef tasted stale and when I asked if they could leave the rice off, as I do not eat it they told me it would cost 2 dollars more. Yes....that is right, 2 dollars more to keep the white rice off the dish. Which was just sitting next to the beef, not under it. So, with all the starving people in this world I had to take this rice and toss it. My friend ordered the chicken Satay....well, we are not exactly sure what she got, because it was take out and by the time we got to our hotel we did not feel like bringing it back. But it was not any satay she had eaten and we are not sure if there was even chicken in it. I don't know how likely I will be traveling to Lancaster again but I will not eat there. I have gone to this restaurant several times in the last 24 years. I moved out of the area about 7 years ago but was traveling through Lancaster. Very fast service, great for takeout or eating in. I love the Panang. I have been to a lot of Thai food places but nothing compares to theirs. Good prices too, always a great meal. I've been coming here for years. the pricing is amazing, the portions are amazing and best of all the taste is amazing! I recommend the beef bowl its amazing! Staff is very friendly and the food comes quick! 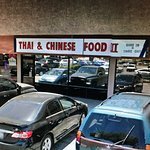 Assuming this is the correct one (there are two with similar names within a mile of each other; go to the one behind Carls/Burger King) this a a great little hole in the wall restaurant. Very nice people, huge portions...my wife and I usually share the garlic beef along with the fried shrimp appetizer and it is enough for both of us and my lunch the next day. Everything we have had here has been very good with the exception of their egg rolls. Dine in or take out, very casual. Fast, friendly service and very good food. Been to Thai N Chinese Foods? Share your experiences!